Detail – the script on either side of the blade. indu cosmology has four ages. In which do we live? We live in the worst. The gods Vishnu and Shiva are asleep and do not hear the prayers of their devotees. It is an age when the natural order of things breaks down, an age of corruption and violence. Two world wars, nuclear weapons, international terrorism, even global warming are all products of this age. It is the Age of Kali, the consort of Shiva. And so I visit the temple of Dakshinkali, 20 kilometres outside Kathmandu. It is the most important temple in this overwhelmingly Hindu country. It is devoted to Kali. The temple stands at the edge of a still, dark valley, surrounded by forested hills and at the confluence of two rivers. ram dao sword we have encountered. The blade, in steel, has a dramatic, undulating shape. 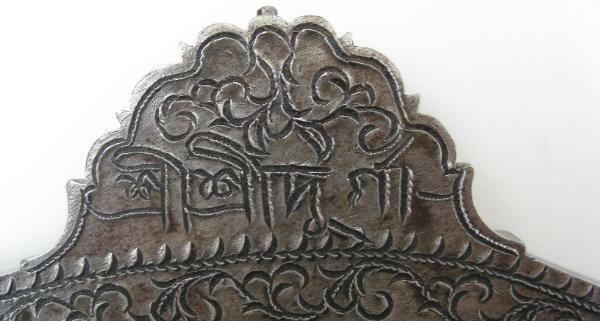 A chased band of foliage decorates the upper edge, which is surmounted by an architectural-type crest etched on both sides with two short inscriptions in Ranjana script, the script that is used by the Newar people up until the mid-20th century. 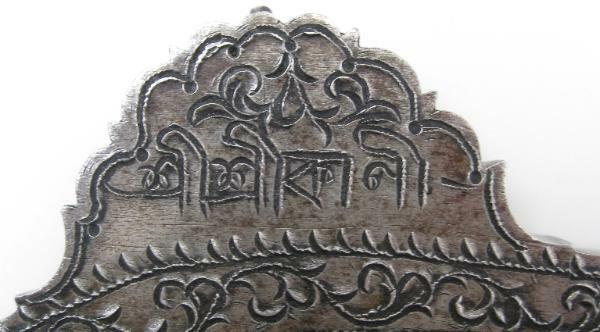 Like Devanagari script, Ranjana script evolved from the now extinct Brahmi script and was in use from the eleventh century. The blade terminates with a round finial. The handle is of wood that has been carved with a lattice-work grip. It terminates with a brass end, and is attached to the blade by means of a heavy, solid brass mount that is cast with a single lotus-bud rising from between a pair of leaves, a motif that symbolises Kali in Nepal and in Bengal. The Newar people are indigenous to the Kathmandu Valley although today, they account for less than 6% of Nepal’s population. Around 80% are Hindu and most of the remainder are Buddhists. Overall, this is a rare, splendid piece. It has enormous presence and is highly decorative.